Through impressive client work and creative members, PRISM has established themselves as Virginia Tech’s next generation marketers. PRISM’s innovative digital marketing techniques have earned them various awards. Check out some of our notable accomplishments. 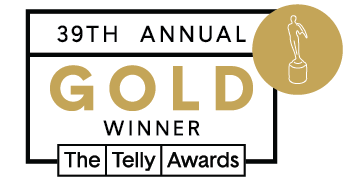 The Golden Telly was introduced in the 39th Annual Telly Awards and PRISM was humbled to be awarded one of the first Golden Telly Awards for the 2017 PRISM Video Reel in the category of Social Video General-Education & Discovery. The Video Reel showcases PRISM’s outstanding client work and the PRISMite’s behind it. The Pamplin College of Business is expanding with the Global Business and Analytics Complex (GBAC), formerly the Business Learning Community (BLC), and they needed a visual representation of what the future of Pamplin will look like. PRISM’s videography team was up to the challenge, creating the “Pamplin College of Business - BLC” video to promote Pamplin’s expansion. In 2017, this video won two Bronze Tellies in the General School/Colleges/Universities category for commercials and marketing. “Welcome to Hokie Nation” was awarded a Bronze Telly in the 37th Annual Telly Awards in the “Online Video: Online Programs, Segments, or Promotional Pieces” category. Created the Pamplin College of Business, the “Welcome to the Hokie Nation” video shines a spotlight on the Virginia Tech’s campus and Pamplin. This video is used to recruit new students to the Pamplin College of Business and encourage high school seniors to accept their Pamplin offer of admission.